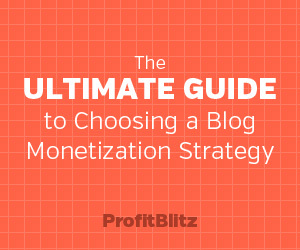 Is it necessary to have a monetization strategy before launching a blog? No, it’s not absolutely critical, but it can help. It’s certainly possible to start a blog and grow an audience without any definitive plans for how you will make money from the blog. But if you do have a plan from the start you can use that plan to help make some important decisions along the way. For example, your monetization strategy might influence the types of posts that you publish at your blog, how frequently you publish, whether or not you accept guest posts, what theme or template you choose for your blog, and the topics that you cover with your posts. If you’re interested in more information and tips on how to make money with a blog, you’ll love the free e-book: Guide to Profitable Blogging. The e-book covers the same monetization methods that you’ll find here in this article, but with far more detail on how you can go about applying the strategies to your own blog. Before we get into the details of how you can go about deciding on a monetization strategy for your blog, we’ll first take a look at some of the most common ways that bloggers make money, as well as the pros and cons of each. One of the first thoughts that comes to mind for most people at the mention of blog monetization is ad sales. Bloggers can sell ad space on their blog and allow companies to market their products or services to the blog readers. Banner ads are the most common form of blog advertising, but other options exist as well (video ads, page peel ads, background or wallpaper ads, and text link ads to name a few). – It’s possible to cash in on your existing traffic with little effort. If you already have a significant amount of traffic coming to your blog, chances are there are some advertisers who would be willing to pay you for the ad space. You have to continue to create new content for your blog regardless of which monetization strategy you choose, so selling ad space really doesn’t create much extra work for you. If you’re not using a network like BuySellAds to manage the ads you’ll need to handle the details of selling the ads and collecting payment, but it can be a good way to cash in on traffic that you already have coming to your blog. – High income potential if you have a lot of traffic. Many of the world’s most highly-trafficked blogs are monetized by ad sales. If you’re able to build a blog with very impressive traffic numbers the potential to make money in this way is quite high. – Can provide some passive income once traffic is established. While authority blogging is definitely not a form of passive income, there are some passive aspects or elements to it. If you’re able to establish a solid base of regular traffic, which usually involves search engine traffic and click-through traffic from links at other sites, you can continue to make money by selling ads with a low level of time commitment. You’ll need to continue to invest time into the blog to keep the momentum going, but the blog archives that continue to attract visitors can serve as a sort of passive income stream through ad sales. – Can be changed and adapted. If you start selling ads on your blog you’re not committed to staying with that monetization strategy forever. Most ads on blogs are sold either by a flat fee per month or on a CPM basis (which is a cost per 1,000 ad impressions). Neither one of those methods commits you to the strategy long-term. In most cases you could decide that you want to stop selling ads and you’d be able to totally remove the ads within a month of that decision. – Sends visitors away from your blog. Every visitor that clicks on an ad at your blog will be leaving your site, at least temporarily. It is common for ads to open in new windows or browser tabs, but there is no guarantee that the visitor will decide to come back to your blog after they’ve clicked on the ad. – Can disrupt the user experience. Most visitors today have come to expect that websites will include some ads, and so they typically will understand having a small number of ads on the site. But excessive ads or ads in certain locations can be intrusive to visitors. The problem is that the more intrusive ads also tend to produce the most revenue because they typically generate the best click through rates. – Requires a lot of traffic. While the ceiling for earnings with ad sales is high, in most cases you’ll need a significant amount of traffic in order to convince advertisers to pay for ad space on your blog. Blog’s with low traffic numbers very rarely make anything significant from ad sales. – Sometimes difficult to grow exponentially. Ad prices typically increase along with traffic increases, but this is not always the case. You may find that the rates advertisers are willing to pay does not always increase at the same rate or percentage that your traffic is increasing. You might be able to double your traffic, but that doesn’t necessarily mean that you’ll be able to double your ad rates. Google’s AdSense is one of the most popular ways to monetize a blog or website. With AdSense you’ll earn a commission whenever someone clicks on one of the ads on your blog. The amount that you earn will vary depending on a number of different factors. – Easy to get started. Just about any blog or website can use AdSense, and getting started is easy. All you need to do is signup and paste the provided code into your site. Getting accepted to the program is easier than with some ad networks or affiliate programs. Google doesn’t expect you to have a high traffic volume in order to use AdSense. – Mostly hands free. With AdSense there really is very little that you need to do. It won’t take up any of your time to manage, aside from checking the stats and maybe making some tweaks to the ad to test some different variables. – You don’t have to worry about filling ad spots. If you are selling ad space on your blog you will need to keep your ad spaces filled, or at least mostly filled. That can take some time and effort on your part. With AdSense, Google will take care of filling the ad spots, so it’s one less thing for you to worry about. – Consistent payment schedule. Google pays AdSense commissions once per month, as long as you’ve met the minimum payout requirement, which is currently $100. Google’s AdSense payments are very consistent and reliable. Some ad networks and affiliate marketplaces have had issues with late payments in the past, so knowing that you will get the payment from Google is a good thing. – Decent income potential. It’s hard to label the income potential for AdSense because it can be used by websites of all sizes and traffic levels. Many sites that use AdSense earn small amounts, but some sites can make very large amounts. From my experience, AdSense revenue is not the most lucrative option for most active blogs, but it’s high enough that it can be considered as part of your monetization strategy. – You have the control to tweak and optimize. It’s possible to increase your AdSense earnings by testing and tweaking your ad units. You have control over things like colors, fonts, sizes, and locations. Those who are most successful with AdSense typically do a good bit of testing to find what works best at their site. – No long-term commitments. One of the great things about AdSense is that you can remove it at any time. If you decide that it isn’t right for your blog or if you’re not happy with the amount that you’re making, simply remove it from your site. – You don’t earn anything unless visitors click. If you have AdSense ads displayed on your blog and no one clicks on them, you won’t make anything. You’re still providing exposure for those advertisers, but you’re not getting anything to show for it. – You have no control over how much you earn per click. Google dictates how much you will make for each click. If you don’t like the amount that you’re being paid per click the only thing you really can do about it is to remove the AdSense unit. The amount that you’re paid will be based on the amount that advertisers are paying for the click, and that can vary drastically from one page to another and from one site to another. – Google can shutdown your account at any time. If Google feels that you have violated the terms of service, your account can be shutdown at any time and without notice. In some cases it can be an unintentional violation of the terms. Typically, you will be fine as long as you are following the terms, but I have seen several people over the years who have had their accounts shutdown for what they felt was not a good reason. If AdSense is your primary income this can obviously be a major issue. – You have to share the ad revenue with Google. Regardless of how much you are making per click, Google is also getting a significant portion of the ad revenue. Since they do the work to bring in the advertisers and to manage the program it only makes sense that they will get a share of the ad revenue, but it still cuts in to your earnings. If you were to sell the ad directly to the advertiser and cut out the middle man you would likely be able to earn more. – Sometimes hurts the look of a blog. Many people feel that AdSense units can make a website or blog look unprofessional and amateurish. Any ads have the potential to hurt the look of your blog, but AdSense units carry an unprofessional stigma in some industries. In almost any industry or niche you can find companies who are willing to pay a commission to website owners and bloggers for referring customers to them. With affiliate programs you can recommend products and services to your readers and you’ll make a commission whenever those referrals lead to a purchase. You can promote the affiliate products and services with banner ads, in your blog post content, in email newsletters, or on social media sites (each affiliate program will have specific terms that you will need to follow). – Huge income potential. Many of the highest earning bloggers make the majority of their money with affiliate marketing. There is no limit to what you can earn, and payouts on some products, especially digital products, are quite high. – Easy to set up. Compared to creating your own products to sell, it’s very easy and quick to get started with affiliate marketing. You just need to sign up for the program and get your affiliate link. – Affiliate programs exist in just about any niche. Regardless of what topics you cover at your blog, there are probably affiliate programs out there that would be a good fit for you. – Make money without creating the product yourself. Selling your own products is also a great way to make money, which we’ll look at shortly, but it is a much bigger time commitment than promoting products as an affiliate. If you’ve got a product in mind that you would like to create to sell at your blog but you don’t have the time or don’t want to invest the time to create the product, chances are there is an existing product with an affiliate program that you could promote instead. – Can be helpful for testing demand. You can also use affiliate products to test the demand if you are considering creating a product of your own. Before dedicating time and energy to creating the product you can test the demand by promoting a similar product as an affiliate. If you make a lot of sales that shows a high level of demand from your readers and it may be worth your time to create your own product. – No need to handle customer service or other hassles. One of the best things about being an affiliate is that your job is over once the sale is made. The seller of the product will need to provide customer service and support their product, but as an affiliate you won’t have that responsibility. – There are countless ways to promote affiliate products. You’re not limited to simply using banners on your blog to promote affiliate products. You can include affiliate links in your posts, write product reviews, write tutorials showing how to use the product, promote it to your email list, promote it through your social networking profiles, or use some creativity and come up with other approaches. – No investment needed. Creating your own products can require major investments of time and sometimes of money. With affiliate marketing someone else has already made those investments to create their product and you can start promoting the product with no investment needed. As a product creator you may need to make a large number of sales to recover your original investment, but as an affiliate you can be profitable from the first sale. – Doesn’t require a huge audience. If you’re blog doesn’t have high enough traffic numbers to make a decent income with ad sales, affiliate marketing may be a better possibility. If you have a responsive audience it doesn’t have to be a huge audience to make some affiliate revenue. Earning the trust of your readers and promoting the right products can allow you to make some money even with a smaller audience. – You’re dependent on others to close the sale. Your success and earnings as an affiliate will be impacted by the ability of the seller to close the sale. You can send loads of prospects through your affiliate links, but if the landing page of the product converts very poorly it will negatively impact what you earn. While this can certainly be a negative, it also can work the other way if the landing page or sales page is effective. – Can sometimes be difficult to know which products to promote. With so many affiliate programs out there it’s not always easy to know which ones you should join and promote. I recommend only promoting products and services that you have personally used or tried. – You’re building a customer list for someone else. When you refer someone who makes a purchase, that buyer will become of customer of the company that made the sale. They will then be able to continue to market to that person well into the future, and in many cases you will only be paid on the first sale. – Lack of control. As an affiliate you have no control over details like the product price, what’s included in the product or service, the landing page or sales page, promotions or discounts, etc. If you were creating and selling your own product you would have full control over those details, but as an affiliate you are limited. – Competing with other affiliates. If you are promoting a popular product or service you are essentially competing with other affiliates that are also promoting the same product or service. The product owner/seller will make money regardless of which affiliate refers the sale, but you’ll of course only be making money from sales that you refer. Sales referred by other affiliates will reduce your own opportunities. Instead of promoting other people’s products as an affiliate you could create your own products to sell. For bloggers, popular types of digital products include e-books, online courses, how-to videos, etc. – Full control. Unlike promoting products as an affiliate, when you are creating your own products you’ll be able to control all of the details. You can decide exactly what will be included in the product, how it will be priced, how it will be presented, if/when to run promos and discounts, etc. – Huge income potential. Successful info products can bring in very large amounts of revenue. If you have an affiliate program for your product and you’re able to get some effective affiliate marketers to promote your product it can increase sales exponentially. – Possibility for on-going income. The lifespan of info products can be rather long, depending on the topic and the details of the information provided. It’s possible that your e-book could still be relevant a few years down the road and still produce a consistent income for you. – Possible in almost any industry or niche. Info products aren’t limited to just the internet marketing industry. In just about any industry or niche you can create an info product that will be helpful to your target audience. Find out what your audience wants to learn or what they struggle with and you can come up with possible products. – Can build on your blog’s content. Info products are a natural extension for authority bloggers. You’re already working on establishing yourself as an expert in your industry and developing the trust of your readers. Info products allow you to take that to another level by providing even more depth and detail, and your existing reputation can be a huge help for making sales. – Helps to build your reputation as an expert. A successful info product will also further help you to establish yourself as an expert in your field. – Digital products are inexpensive to produce and deliver. Physical products, like books, can be expensive to produce. However, digital products, like e-books, can be created very inexpensively. You won’t have to pay printing costs and you can sell the same digital file over and over again. Delivering physical products will involve shipping costs, even if those costs are ultimately passed on to customers. With delivery digital products you may have some bandwidth fees, but these costs will be drastically lower than the costs of delivering physical products. – On-going possibilities. If you have some success selling info products, you can always create additional products and keep the revenue flowing. In fact, you’ll have a list of customers who purchased your first product, and if future products are related you can email this customer list to make some easy sales. – Easy to set up e-commerce. If you’re just selling a few digital products, the process of setting up the e-commerce can actually be quite simple. Systems like SendOwl, DPD, and E-Junkie are perfect for bloggers who just want to sell a few digital products. They’re easy to set up and inexpensive. You can see more details here: Get Started with SendOwl for E-Commerce, Get Started with DPD for E-Commerce, and Get Started with E-Junkie for E-Commerce. – Requires a lot of work. While the income potential for info products is very high, it takes a lot of time and effort to create them. If you’re dealing with very limited time you may be better off promoting products as an affiliate. – No guarantee of sales or profit. It’s possible that you could invest a huge amount of time into creating an info product that ultimately does not produce many sales. It is, of course, also possible that your affiliate promotions won’t produce sales, but the time investment for creating your own products makes it a bigger loss if they don’t sell. – You need to be an expert if you are charging. While you can start a blog on any topic that you choose, if you’re going to be producing and selling info products you’ll really need to have some expertise on the subject. – You’ll be competing with free content. Most info products contain some of the same information and content that can be found elsewhere online for free. Ideally, your info product will be more in-depth and more complete than other content that can be obtained for free, plus the other big advantage is convenience. Although there is a lot of free content available, finding what you need isn’t always easy. – Can sometimes create confusion over free vs. paid content. If you’re publishing free content on your blog and selling other content as an info product it can sometimes be difficult to decide which content you should use on the blog and what you should sell. Knowing where to draw the line can sometimes prove to be a challenge. Another option is to create a members-only area at your blog or to sell access to premium content. Your customers/members can get access to information, resources, videos, or webinars that are not available for free on your blog. – Recurring income. Membership websites typically involve recurring payments. The members may pay a monthly or annual fee in order to retain access to the site. Typically those recurring payments are made automatically until the member cancels. Recurring income is what most people love about running membership websites. – High income potential. With most membership websites the income will steadily increase over time. As long as you’re getting new members to sign up at a rate that is greater than the cancellation rate of existing members, your income should continue to increase. – High lifetime value per sale. Members that stay with you for a while will typically have a higher lifetime value than you would get from a one-time sale. For example, say you have an e-book that sells for $19. Instead of selling it as an e-book you could use the same content to create a members area on your website and charge $5 per month for access. If a member stayed with you for a year you would make $60 instead of the $19 that you would have made from the one-time sale of an e-book. Of course, in order for people to keep their memberships active they’ll need to have some sort of incentive. Most membership websites regularly add new content or resources to keep members interested. – Predictability of income. Most membership websites have a fairly steady renewal rate from month to month, which allows you to be able to somewhat accurately predict what you will be able to make in a given month. For example, if you typically lose about 20% of your members each month and you currently have 100 members on a monthly payment plan, you can estimate that in the next month you’ll collect payments from about 80 members that do not cancel. – Can be difficult to set up. Membership websites are not the easiest to set up. You’ll need a system that will collect payment, create user accounts, protect your content so only active members can view it, and cut off access when members cancel. While there are a lot of different membership systems, many of them have a reputation of being complicated to set up. Fortunately, in recent years a number of different WordPress plugins have been developed to manage membership sites, and most of them are pretty easy to use. My favorites are MemberMouse, Cart66, and Restrict Content Pro, but you can see more details at this page: WordPress Membership Plugins. – Many people are hesitant to sign up for recurring payments. One thing that I’ve learned from my experience with membership websites is that a lot of people really don’t like to sign up for recurring payments, even if they can cancel those payments. Most customers would prefer to make a one-time purchase. If you run a membership website the best thing you can do is make every effort to create as much value as possible for your members. If people view your membership offer as a great value or as something that they really need, they will be much more likely to be ok with the recurring payments. – Requires on-going work to retain members. Every membership website will have cancellations, but being able to retain a healthy percentage of your members is critical to having success with a membership site. Your members will need some incentive to keep their membership, and that usually means that you’ll have on-going work to produce content or resources for members. Most, but not all, membership websites are fairly high maintenance for their owners. Some bloggers publish posts that are sponsored by advertisers. The most common types of sponsored content are product/service reviews, announcements, and giveaways. With reviews you will typically be given free access to try out a product or service, and the company will pay you to publish your review on your blog. Sponsored announcements are sometimes used when a company has a new product or has some other major announcement that they want to receive some added exposure. With giveaways you may be able to charge companies for exposure on your blog to run a giveaway where one or more of your readers can win a free copy of the product. – High demand. Advertisers love sponsored reviews and other types of sponsored content, so there is a large demand for bloggers who are willing to publish sponsored posts. – Can be effective for advertisers. The main reason for the high demand is that sponsored posts can be very effective for advertisers. While you’re main concern as a blogger may not be the success of your advertisers, selling any type of ad requires that the ads are cost effective or else the advertiser won’t purchase another ad with you in the future. – High rates are possible. Sponsored reviews are typically one of the more expensive types of advertisements. They give great exposure for advertisers, and that means that you can charge appropriately high rates for it. – The content can potentially be helpful for readers even though it is sponsored. Just because a post is sponsored doesn’t mean it has to be useless to your readers and blog subscribers. If you are careful about the types of sponsors that you accept and if you make an effort to create sponsored posts that provide helpful information for readers, these posts will be received with much less resistance from your readers. – Doesn’t require a huge audience. Many advertisers that pay for sponsored posts are willing to consider working with smaller blogs. Of course, the amount that you can charge will be influenced by the size of your audience, but it is possible to make some money with sponsored posts without having a large audience. – Limited availability. You can only publish so many sponsored posts before it becomes annoying to your readers. The amount of sponsored posts will depend on factors like how frequently you publish regular blog posts, because you don’t want to number of sponsored posts to be too high in comparison. – Can turn off some readers. Publishing just one sponsored post can turn off some readers. This won’t apply to the majority or your readers, but some readers don’t like the idea of blogs publishing any sponsored content. – May require a lot of your time. If you’re writing a review you will need to dedicate time to use the product or service before you can even write the review. This can wind up leading to a significant amount of time depending on the product or service. Be sure that you account for this time when pricing sponsored posts. – Can put you at risk for a penalty from Google. Google will penalize sites that are known to buy or sell links. If your sponsored posts include links, which of course the sponsor will want, Google may see it as selling a link. You can use nofollow tags on links in sponsored posts to tell Google to ignore the link and not to pass PageRank, which is Google’s suggested method for handling paid links. The last monetization method that we’ll look at is selling your services through your blog. An example would be if you market consulting services and charge people an hourly rate for those consulting services. – Lots of possibilities. There are a lot of different ways that you can promote your services through a blog, and there are a lot of different types of services that you could provide. In general, any type of service provider can use a blog on their website to help promote their services. Some common types of services that may be offered by bloggers would include any type of consulting, writing, web or graphic design, photography, and marketing. – Builds on your expertise and authority. Blogging is a great way to promote your services because with an active blog you will be working to develop your own expertise and authority within the industry. Once you’ve established some name recognition and a reputation as an expert in the field, promoting your services becomes much easier. – Possibility to charge high rates. If you’re able to establish yourself as an authority through your blog, you’re likely to be able to charge higher rates than you would be able to charge otherwise. – Can be used in combination with product sales. If you’re offering services it doesn’t mean that you can’t pursue other monetization options as well. In fact, services can work quite well in combination with product sales. For example, you could offer a combination package as an upsell to one of your products. Maybe you’ll offer an e-book for $39, or the customer can choose to purchase the e-book and a one-hour consultation for $99. – You’re trading time for money. When you’re selling a digital product, promoting affiliate products, or selling access to a members-only area of your site, there are no limits to how much you can sell or what you can make. You can sell to customers all around the world, and they can purchase from your website 24 hours a day, 7 days a week. With services you are trading your time for money, and there is a limit to how much time your have available. Once you’ve filled up all of your available time you’ll need to increase your rates if you want to earn more money. Most profitable blogs will earn income from more than one method, so it is possible and preferable to combine a few of the methods listed above. Now that we’ve taken a look at the pros and cons of several of the most common ways to make money from a blog, let’s look at the things that you should consider as influential factors when deciding which methods to pursue for your blog. How much time do you have to invest into your blog? The monetization strategy you choose will have a dramatic impact on the amount of time that you’ll need to be able to maintain the blog. If you decide to monetize the blog by selling ad space you’ll probably need to publish posts frequently, meaning that you’ll need to either spend a lot of your own time writing posts or outsource the work to other writers. Publishing more content on your blog typically will give you the best chance to attract large amounts of traffic, which you will need if you want to make money from ad sales. Using a members area as a monetization strategy is also likely to require a large on-going time commitment in order to continue to provide enough value that you’ll be able to retain members. As a result, if your time is very limited, ad sales and membership may not be the best monetization options because of how much time it will take to be successful with these approaches. Creating your own info products will require a significant amount of time, but with most info products that time commitment will be front loaded. You’ll need to dedicate a lot of time to creating the product, but going forward it may not require a large chunk of time after the product has been created. You’ll need to be able to provide some customer service, but usually with info products this is very minimal. You may also need to dedicate some time to marketing and promoting your product, but if you’re able to get some affiliates to do that work for you it will reduce how much time you have to spend on it. Of course, you’ll also want to consider how much money you can make with a particular strategy. When it comes to income potential you’ll also need to consider what you want to get out of the blog. Are you hoping for something that can bring in a few hundred dollars per month that will just provide you with some extra money? Are you simply looking for a way to make a little bit of money from a blog that you run as a hobby? Are you looking to make a more significant amount of money that might lead to a full-time income within a few years? Are you looking to be able to earn a full-time income as soon as possible? From my experience, creating and selling your own products has a very high potential for income, and with the right approach it’s also something that can produce income relatively quickly. Creating the products, of course, will take time, but once it is created you can start to make money right away. In some cases, people have been able to make a significant amount of money rather quickly even with no existing audience (see this story of Nathan Barry). Getting influential affiliates to promote your product is also a great way to start to make money without a long wait to build your audience. If you’re looking to build a significant income over a period of time but you don’t need a large amount of income right now, you may want to focus on building a blog with a great reputation for high-quality content and start building a mailing list. As your reputation and your reach increase you can introduce a members-only area for exclusive content. Your strong reputation and the mailing list that you’ve built will help you to get visitors to sign up for the memberships. As you continue to work on adding value to the membership by adding new content your income from the membership payments should steadily increase. If you’re just looking for a smaller amount of money, AdSense or promoting affiliate products may be a good fit. Neither requires much time to set up or to maintain, and both can produce some income for you, even with a lower traffic level. 3. How Does it Fit with Your Blog’s Content Strategy? Not every monetization method will be a good fit with your blog’s content. If you publish long-detailed posts but you don’t publish frequently, selling ads or using AdSense may not be a great fit. This content strategy is better for establishing your reputation and developing the trust of your readers, and less effective at getting the maximum number of page views that will be needed in order to make money from ads. In this case you may be more effective at monetizing your blog with product sales or a members area because you can benefit from your reputation and the trust of your readers more effectively. If your content strategy involves frequently publishing a lot of short posts (think of celebrity gossip blogs), that may be a better fit for selling ad space or using AdSense. These types of blogs tend to attract a higher number of page views because of the quantity and short length of the posts, so they can often make more money from selling ads. 4. How Does it Fit with Your Long-Term Plan for the Blog? Do you have any long-term plans for your blog? If so, make sure that any monetization method you choose does not negatively impact those plans. For example, if your long-term plans involve a low maintenance blog I would not recommend that you add a members area. Managing a membership website typically requires a lot of time to keep your members engaged. Plus, as your numbers of members increase you will need to dedicate more time to customer service and administrative tasks (of course, you could always outsource work). As another example, if you know that you ultimately want to create and sell a specific product at some point in the future you may not want to promote any products as an affiliate that would compete or reduce the need for your own product. Or, if your long-term goal is to run a high-traffic blog that makes its income primarily from ad sales, don’t dedicate large amounts of time to creating your own products to sell. Instead, focus your time on creating as much content as possible and work to build links that will increase your search engine rankings. You’ll also need to consider the amount of time and money that you will need to invest into the site with a particular monetization strategy. For example, with AdSense there is no financial investment needed and very little time needed to set it up. With product sales you’ll need to invest a lot of time to create the product, and maybe some money will also be needed to create the product. You’ll need to invest some time to get the e-commerce set up, and you’ll also have some on-going costs for selling and delivering the products. With a members area you’ll need to invest some money to buy software or a plugin to power the members area, and you’ll need to invest time to set it up. You’ll also need to invest time, money, or both to keep the members area up-to-date and to encourage memberships to remain active. Some things will be easy to set up, like adding AdSense to your blog, and others will be much more difficult. Getting a members area set up is possible for anyone to do with the help of a WordPress plugin, but it’s not always easy. Promoting affiliate products at your blog won’t require much time or effort, but creating your own products to sell will require that you get the e-commerce system set up. And if you’re choosing to pursue e-commerce not all platforms are the same. Something like DPD or SendOwl will allow you to sell products with only a small investment of time to get it set up. Think also but what is needed in order to be able to make money with any approach that you are considering. For example, in order to make money selling ads you will need a large volume of traffic, a targeted and responsive audience, and companies that are looking to sell products or services to your target audience. If any of those elements are missing it will be difficult for you to make anything significant with ad sales. With affiliate marketing you will need quality affiliate products to promote (usually not a problem), a decent revenue share being offered to affiliates, and a method to promote the product to your readers. Your method could be to use a banner ad, but you’ll usually get better results if you have a mailing list that you can promote it to, or if you create some blog content in order to promote the product (like a review or a tutorial). 8. What are Other Blogs in Your Niche Doing? Take a look at the other blogs in your niche and see how they are monetized. If most blogs include banner ads, there are probably some companies willing to pay to advertise to your audience and most readers will be used to blogs/sites that include ads. If most blogs in the niche are using AdSense it may be a sign that AdSense clicks tend to pay a decent amount on topics related to your niche. However, there are times when you may want to see what other blogs in your niche are doing so you can take a different approach. If there are a lot of blogs that are changing members for exclusive access you may have a lot of competition if you offer something similar. If a lot of blogs are already selling e-books or info products you may want to stay away from creating your own products that cover the same topics. If no blogs in the niche seem to be offering an info product on a subject in which you are an expert, it may be a great opportunity for you. Regardless of which monetization approach you choose I would encourage you to diversify so that you don’t have all of your eggs in one basket. Ideally, you’ll want your blog to make money in at least 2 or 3 different ways, and this becomes more important if you’re looking to earn a full-time income from your blog. You don’t need to add multiple income streams all at once, but plan to diversify over time as your blog grows. I’ll end this article by giving a few thoughts about each monetization method covered in this article and when it might be a good or a bad fit. Please keep in mind that this is just my opinion and is based on my experience and what I have seen from other bloggers. These are not absolute facts that dictate whether you will or will not make money with a particular approach. Use your own judgment to determine what is the best fit for you. Good fit for: High-traffic blogs that publish content frequently. These are often multi-author blogs. Bad fit for: Blogs with low traffic and blogs that also sell their own products (takes attention away from your own products). Good fit for: Niche blogs and other low-traffic blogs, blogs in industries with high costs per click, or in small amounts as a supplement to other monetization methods. Bad fit for: Authoritative or highly-professional blogs, blogs that also sell their own products. Good fit for: Just about any blog. I think almost any blog can make good use of affiliate programs in some capacity. Blogs with large mailing lists and highly responsive audiences are excellent candidates for affiliate marketing. Bad fit for: Blogs that sell products that would compete with the affiliate products, and blogs that need to maintain a high level of independence and neutrality. Good fit for: Bloggers who want to establish their expertise on the subject, bloggers who want to maximize their income potential, and bloggers who are willing to invest the time needed to create a highly-valuable product. Bad fit for: Bloggers who aren’t able to commit the time to create a product of the highest quality, and those who are new to the topic covered by their blog. Good fit for: Bloggers with an established reputation, bloggers with a long-term vision, and bloggers who are able to invest a considerable amount of time on an on-going basis. Bad fit for: Bloggers with very limited time, those who are new to the topic covered by their blog. Good fit for: Bloggers who are looking for a way to supplement other income sources, bloggers who already sell other types of ads on their sites, and bloggers with strong reputations. Bad fit for: Bloggers who want to be viewed as unbiased, bloggers who see sponsored content as a primary means for monetizing their site. Good fit for: Bloggers who already offer services (like photographers, designers, etc. ), bloggers who want to establish themselves as an expert in the industry, and bloggers that have adequate time to dedicate to clients. Bad fit for: Bloggers who don’t have the experience or expertise to justify a high rate for their services, and those who don’t enjoy client work. Please feel free to share your own experience in the comments. And if you have any questions please feel free to ask.